For Rachel Kelly in the City of Burlington’s Office of Public Information, the city is always challenged with finding ways to stimulate greater levels of citizen engagement. Having a city website that can serve as a platform for news and information, and help to stimulate civic dialogue, is essential. Fortunately, thanks to the city’s long-term partnership with CivicPlus®, Kelly and her team have had the opportunity to continually evolve their city’s digital presence to take advantage of new technology, and continue to optimize its civic engagement strategy. 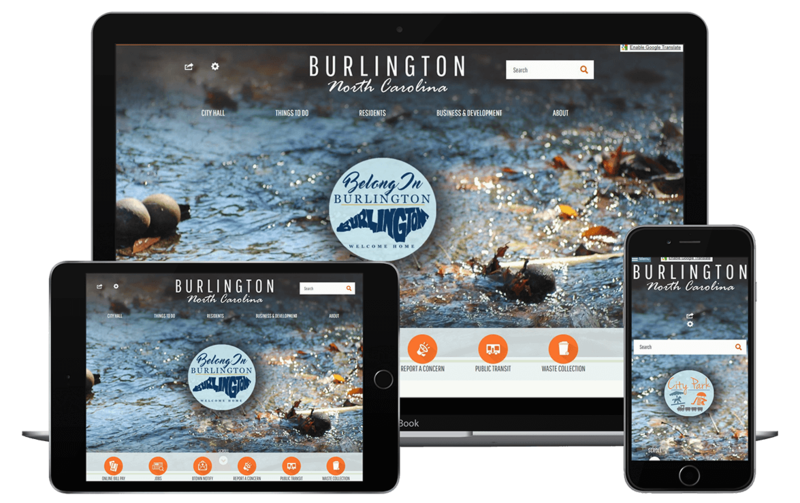 The City of Burlington has been utilizing CivicPlus’ CivicEngage® website content management system (CMS) for over a decade. Over the years, the City has worked with the CivicEngage design team to redesign its website and evolve its digital strategy. According to Kelly, the City’s latest website redesign, which took place in 2015, focused on giving its citizens exactly the features and functionality they wanted and needed most. To accomplish this goal, Kelly and her team took a qualitative and quantitative approach to building an informed redesign strategy. As part of its research, the City also engaged students from nearby Elon University’s business school to obtain feedback directly from residents. According to Kelly, enhancing the city website’s structure—and its 1,600-plus pages—meant a focus on navigation. When it came to envisioning the look of the redesigned website, Kelly and her team drew inspiration from their citizen research, including the Elon University students’ surveys, and data obtained from user testing. After the launch of its redesigned website in 2015, Kelly and her team received positive feedback from citizens. In addition, data the City obtained from CivicPlus validated that their informed strategic decisions had helped them to accomplish their goals. Today, the citizens of Burlington are better able to find the information they want and need, and to navigate the City’s website. Also, according to Kelly, the addition of custom footers at the bottom of each page has helped citizens better direct inquiries and reach the necessary departments directly with their phone calls. Not only have the City’s efforts been recognized by its citizens, they have been recognized in website design competitions from the North Carolina Association of Government Information Officers (NCAGIO), and North Carolina City & County Communications (NC3C). Kelly and her team announced the redesign of their city website during a city council meeting. As part of the City, and CivicPlus’ commitment to constant evolution, Kelly and her team are already thinking ahead to their next planned redesign. Kelly plans to incorporate the results of the City’s upcoming branding exercise into the website’s next evolution. In thinking about the next website redesign, Kelly plans to draw on the lessons learned from its recent experiences. If your community is ready to redesign its website to ensure a more engaging citizen experience, get started with our free Local Government Website Redesign eBook.